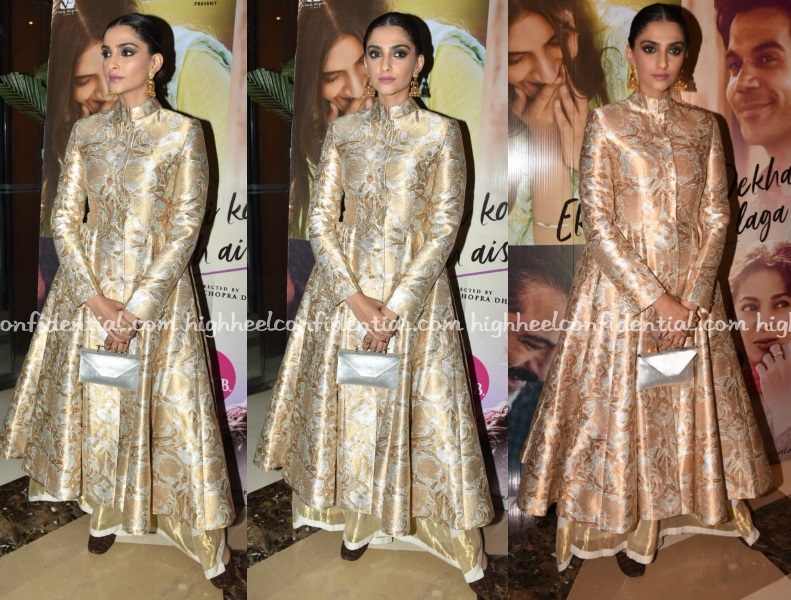 At the unveiling of Ek Ladki Ko Dekha’s second trailer, Sonam opted for a Rajesh Pratap Singh brocade bandhgala jacket but instead of wearing it the way it was presented, paired it with a white and gold veshti. Unfortunately, with the kurta already being so gaudy and flared, it needed a fitted churidaar and a subtler clutch to balance it all out. As is, I wasn’t a fan. It was all too overwhelming. Did you like? Why? Why would you wear this? And why would you wear with that? Her make up is always off! This outfit is just way OTT!!! Why in first pic models are wearing masks? Agree with the styling part. The Artisan Speak fashion show was in Delhi and part of it was also a focus on the pollution in the city. The kurta/bandhgala is gorgeous. Fitted pyjamas/churidaars/cigarette pants would have helped balance the look. I have noticed off late that Sonam Kapoor makes a great look mediocre/wtheyy-ish by giving a twist to one element that doesn’t work. Experiment with fashion doesn’t have to be comical. Her make up seems to be off nearly 80% of the time. For someone who is so focussed on fashion and her public appearances , how tough is it to get a make up artist who knows her foundation shade ? Ha, ha! So this is the thief who stole my Paris Apartment drapery. Delhi is the most polluted city in the world probably. It can damage your lungs pretty fast. Did I like it, you ask? I, sadly, can’t seem to get on board with anything Ms.Kapoor wears these days. She has started looking like her husband already…! First pic she is wearing gold sneakers on top of all the gold! Oh my! Second pic she dumped the gold sneakers but BUT still a WTHey. Last few pics, she brought out the clutch and still couldnt salvage it. The clutch photographs so differently because of the texture and flash. First pic is of a model n not Sonam. First pic with golden sneakers is not Sonam, it’s the model. On Sonam the weird bottoms make it look not so pleasing. Moreover, the concealer is applied in such extra large quantities, which isn’t required. Kya se kya ho gya dekhte dekhte !! In the name of fashion, she dresses up in bizarre ways off late! The kurta is absolutely not meant to be worn with a dhoti/veshti. I disagree with her fashion sense like most of the times. Why is she always caked up in makeup? For somebody so pretty, she needs a better make up artist. There is an event for unveiling of a second trailer??? the reasons people come up with these days…sheesh! There really is no design element or restrain in this outfit. Seriously, this outfit is so wrong! 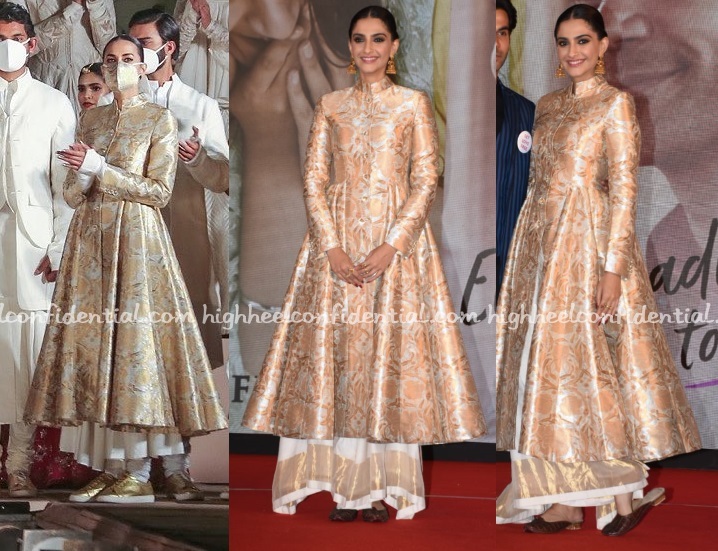 Appropriating a veshti to make an already shiny, blingy outfit into a shabby mess. Why not wear simple churidars with jootis? That Veshti did not look beshti!